Create your professional free personal financial statement today with our free online personal financial statement software. For individuals, investors, business owners, accountants, CPA’s, attorneys, and financial institutions. 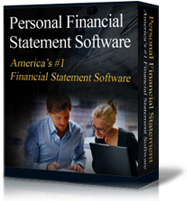 Our free personal financial statement online automatically performs all math calculations. Our Free Personal Financial Statement can be accessed immediately. Lenders and others usually require a personal financial statement to assess an individual's assets and liabilities and look at a person's expenses and long-term liabilities. Whether you are applying for a loan, working on a real estate investment, or some other business transaction, our detailed personal financial statement software will cover just about every important topic that is usually required by banks, lending institutions, and the courts. Automatically add up all the numbers in each category. Those numbers from each category will automatically be transferred to the totals column in both the assets and liabilities column. (Example: You own 10 different pieces of real estate, our software will automatically total the values for all ten properties and then automatically transfer that total to the column for all real estate owned). Automatically calculates your net worth. You will find our personal financial statement software easy to use. Simply fill in each category with your numbers and all the math calculations are automatically done for you. Then you can print your personal financial statement in a professional easy-to-read format. Download a fully functional trial version of our #1 rated personal financial statement software. Access our free personal financial statement online. Click thumbnails below to see actual screen shots of our personal financial statement software.